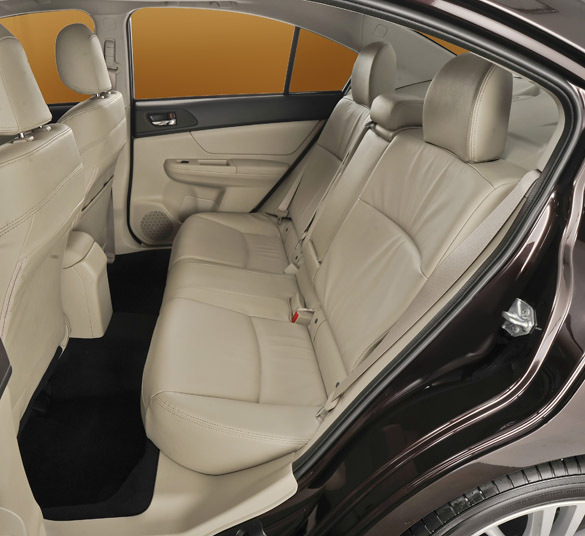 The all-new 2012 Subaru Impreza has received a much anticipated makeover inside and out. 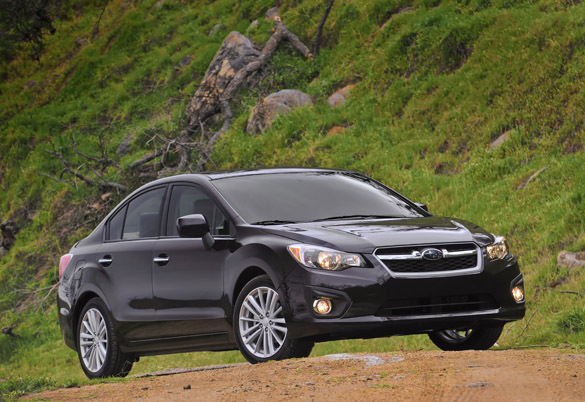 Most notably, is the all-new 2012 Impreza’s sleek exterior appealing to a much broader audience than previous years. Adding to the 2012 Impreza’s new-found character in the looks department, is a much more efficient powertrain and Subaru’s standard all-wheel drive system. 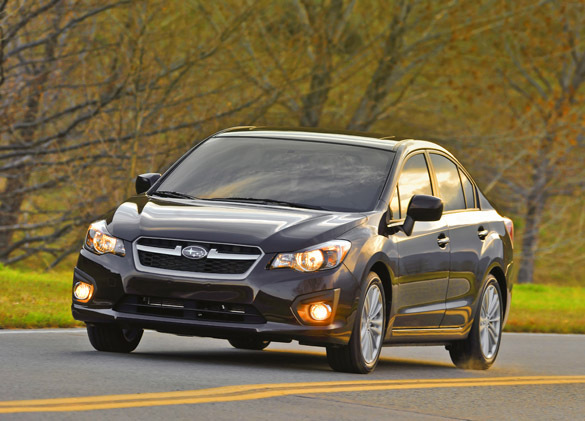 The Subaru Impreza reclaims itself as an excellent alternative to other vehicles in the midsized to small sedan segment. 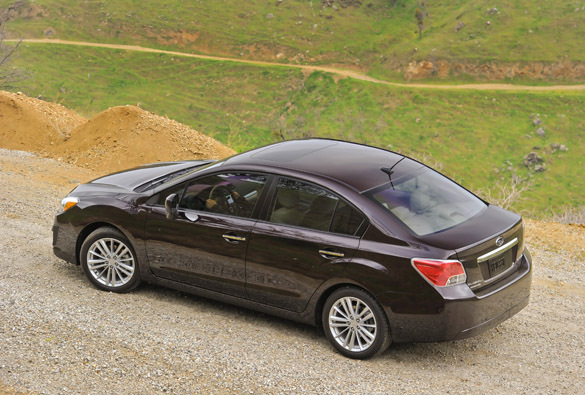 By keeping Subaru’s standard all-wheel drive system intact, adding a more efficient 2.0-liter 4-cylinder engine and a roomier cabin to boot, the all-new 2012 Impreza becomes an appealing yet affordable package. My 2012 Subaru Impreza 2.0i PZEV (Partial Zero Emissions Vehicle) Limited tester musters out 148 horsepower and 145 pound feet of torque from its 2.0-liter boxer 4-cylinder engine. 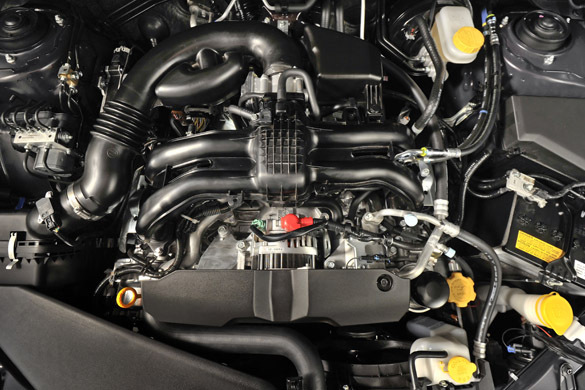 The engine is mated to a continuously variable transmission (CVT) to power all four wheels through Subaru’s “symmetrical” all-wheel-drive system splitting power 50/50 front and rear. Most noticeable to an enthusiast like me in the new Impreza 2.0i, due to it being short on power, is its lackluster performance. My Impreza 2.0-liter takes about 9.6 seconds to reach 60 mph. That is a bit slow when compared to its main-stream competitors. Fuel efficiency is a plus for the sluggish performing Impreza, easily reaching 36 mpg on the highway and maintaining 27 mpg in the city. Much of the Impreza’s fuel efficiency is due to the smallish 2.0-liter engine and continuously variable transmission working in sync, which I find to be a bit slow in reacting to driver inputs. One moment the engine is buzzing away at medium throttle input while a few seconds later the rpm drops as if you let off of the gas pedal. I have experienced much more intelligent CVT units in other makes. The new Impreza’s ride quality is good and quite predictable for a midsized vehicle. Steering feel is a bit numb but also expected due to having an electric steering rack. The suspension does tend to get rather spongy when taking turns at speed. Do not expect the tires to bark much, though. 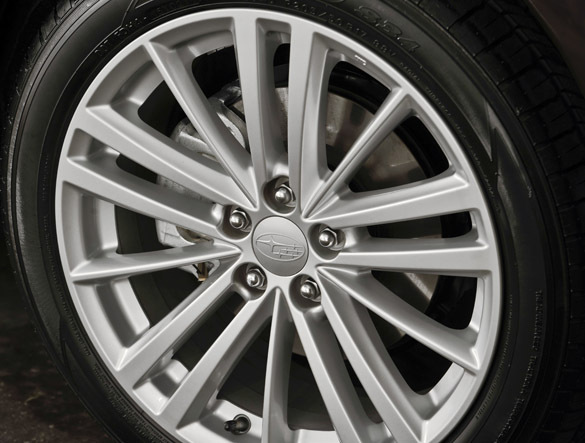 Splitting 148 horsepower between the front and rear wheels does not allow you to dig the lower profiled 17-inch tires into the pavement much. However, some of the better handling attributes over the outgoing model is due to the new 2012 Impreza’s lighter weight, about 165 pounds less. 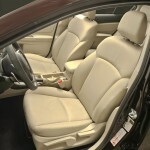 Aside from the new 2012 Subaru Impreza’s mulling powertrain, interior space has been upgraded to spruce up what was thought to be among the cheapest looking interiors of the midsized sedan category. I have to say, Subaru still has a way to go for improving the over-all perception of quality in their interiors. My 2012 Impreza Limited test vehicle still suffered from an anemic quality of materials only to be simulated by plastics. Over-all, the newly designed interior is a much needed improvement over the last generation. Inside the cabin I took a liking to the ample space and vast amount of adjustability in the front seats. Finding a comfortable seating position may take a while with the manual seat controls, but it is fully attainable for just about any size adult thanks to the standard height adjustment. The new 2012 Subaru Impreza Limited sedan has a decent list of standard features adding creature comforts such as an automatic climate control, Bluetooth connectivity with audio streaming, leather upholstery, leather wrapped steering wheel and shifter, heated front seats, 17-inch alloy wheels and fog lights. Vehicle controls are simple with the foremost exception of my Impreza’s optional LCD touch-screen with GPS navigation. 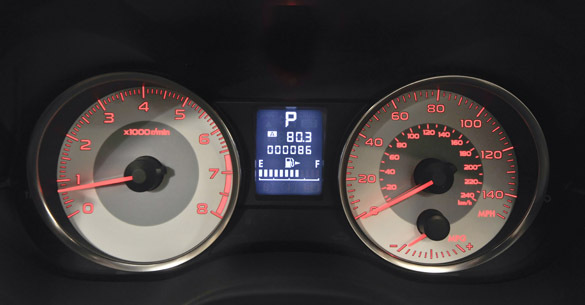 Subaru has received flak over the years for a user interface that was clearly behind the competition. Unfortunately, the new 2012 Impreza does not improve upon the interface much from the last generation despite upgraded menus and color icons. The stereo system, for starters, still utilizes a primitive way for adjusting tones through an incomprehensible equalizer setup. Moreover, accessing other audio controls and settings through the touch screen is a cumbersome task even after spending 15 minutes navigating through the interface. Not to mention, the virtual buttons on the touch screen are at times too small for big fingers. 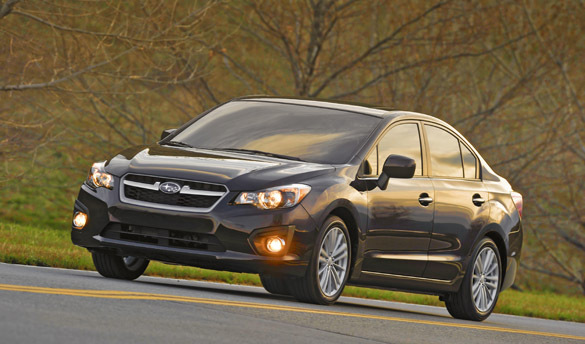 Leveling up to the Impreza WRX will leave you with last year’s design and smaller interior proportions. We look for Subaru to eventually mold the newly designed Impreza to all other trim levels, including the high-performance turbocharged 305 horsepower Impreza WRX STI. 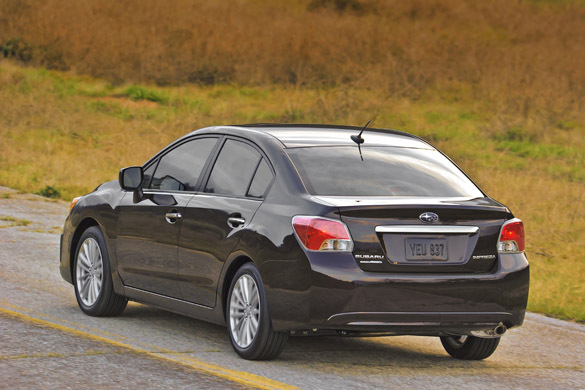 With a new attractive exterior design, quality craftsmanship and standard all-wheel drive, the new 2012 Subaru Impreza sedan improves its standing in a long line of highly competitive vehicles within the midsized to small sedan segment. Having a striking low MSPR of only $17,495 for the base 2.0i trim level, the new 2012 Impreza looks better than ever next to its competition. Not to mention, the fuel efficiency and touted all-wheel drive further adds to the already eye-catching equation. My 2012 Subaru Impreza 2.0i PZEV Limited test vehicle had an as-tested price of $24,645, plus $750 destination and delivery charge, including the options of a power moonroof and the LCD touch screen w/ GPS navigation system. The next trim level from the 2.0i is the 2.0i Premium and my Limited adding auto climate control, fog lights and alloy wheels. 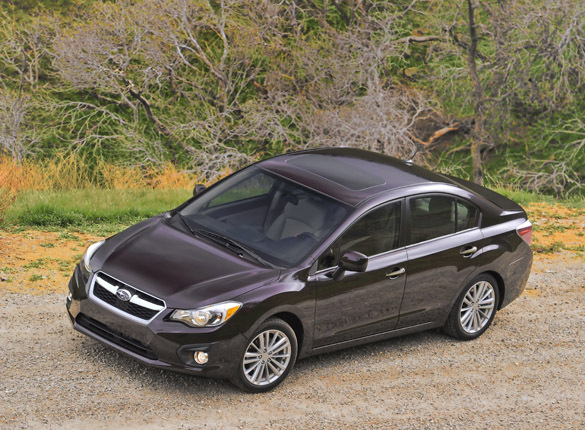 The all-new 2012 Subaru Impreza is a great flavor alternative to the typical vanilla sedans on the market. You can think of the redesigned Impreza as a vanilla Sunday with rainbow sprinkles; it looks better than it tastes to some while there is a loyal following that will always pleasure a well-known treat with new toppings. EPA cargo volume: 12.0 cu.ft.